*According top the AP, R&B singer Chris Brown admits probation violation, ordered to 131 days in jail. In court Friday afternoon, the singer/dancer admitted he violated his probation by getting into a fight with a guy in Washington D.C.
Because of that the judge gave him a year behind bars. But fortunately for him, he won’t have to do the full sentence because he got credit for 116 days he spent in rehab, and another 59 days in lockdown. That leaves 131 days he has to serve. TMZ notes that Brown could have received a 4-year sentence, but caught a break because the judge took into account he was recently diagnosed with bipolar disorder, which could account for some of the violence. In addition to the jail sentence, Brown was ordered to attend therapy sessions 2 times a week and he must submit to random drug testing 3 times a week. On top of all the preceding, Brown is not clear of legal issues; his D.C. assault trial is set to start in several months. 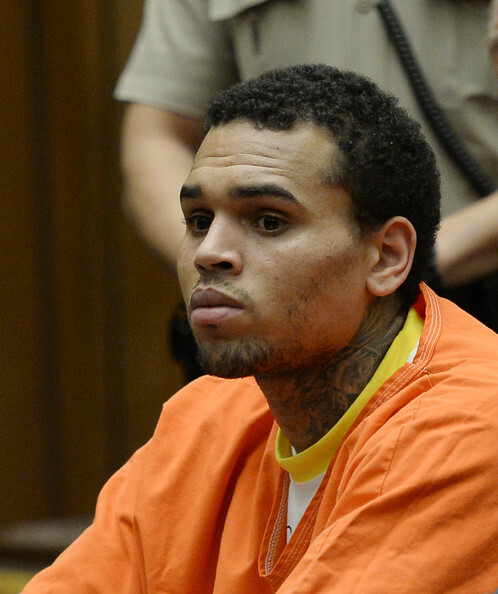 But there is some possible good news for Chris Brown concerning his jailing. It’s possible he could be released a lot earlier because of overcrowding in the jail. Hang in there Chris. One day at a time, but you have got to do the work and take better care of yourself. Millions of people luv you. He’s in the belly of the beast. It’s easy to get into but hard to get out unless you follow their rules. I hope he respects his freedom when this is all over.